I picked up some Easter egg cookie cutters on a whim last month. I was at Michael’s (probably no big surprise!) and went a little crazy shopping their Easter displays. I bought a whole bunch of stuff since I had one of their awesome coupons and couldn’t resist the cute cookie cutters. I was thinking of making cookies, but changed my mind last minute and made Easter Egg Hand Pies. They were a hit with my daughters and their friends! I used one 9 inch refrigerated pie crust dough (my fave is Pillsbury! ), milk chocolate chips, vegetable oil and sprinkles galore. Inside each Easter egg is melted milked chocolate chips. For the exterior, I melted milk chocolate chips and vegetable oil in the microwave and brushed the mixture on one side of my egg. Immediately, add your sprinkles on top. The chocolate acts like a glue to hold the sprinkles in place. You could also use Smarties (the Canadian kind! ), Skittles, M&M’s or whatever small candies you like. This is also a fun dessert for the kids to make with your supervision. They can paint their chocolate eggs and decorate them how they like. I searched my blog for more Easter recipes and crafts to check out. 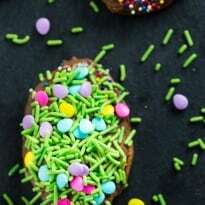 Take a peek at these recipes: 12 Easy Easter Desserts, Chocolate Dipped Peeps, Easter Marshmallow Pops, Easter Lamb Marshmallow Pops, Easter Peanut Butter Cookies and Easter Puppy Chow Mix. If Easter crafts are your thing, check out these Rubber Band Easter Eggs. You might also like these candy alternatives for your child’s Easter basket. 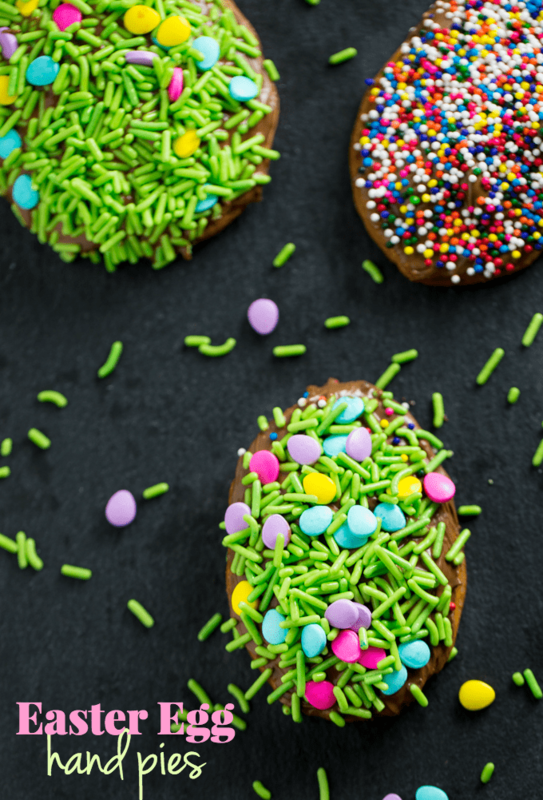 Do you make any special sweets for Easter? 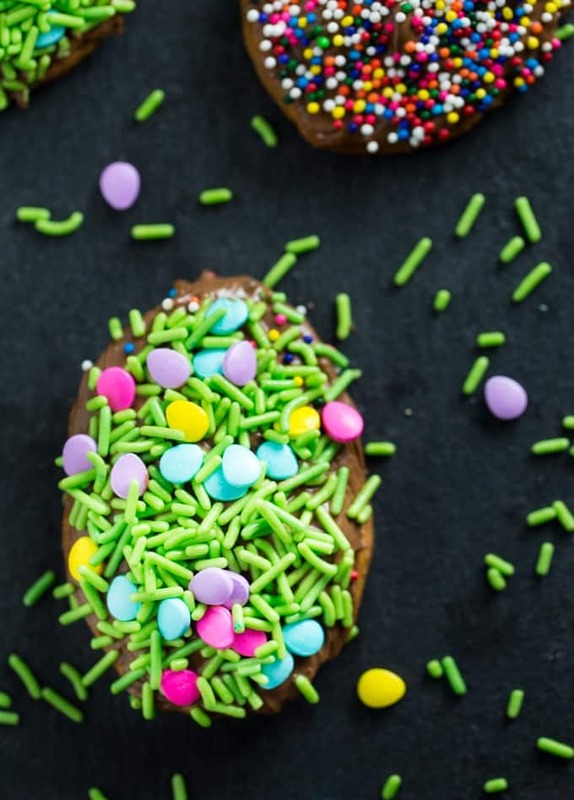 Super easy Easter dessert made with refrigerated pie crust, melted chocolate and sprinkles! A fun Easter recipe for the kids to make. Roll out refrigerated pie crust on a clean surface. Use egg shaped cookie cutters to cut out an even number of eggs. Place one egg on a greased baking sheet. Add about 1 to 2 tsp of milk chocolate chips to the centre of each egg. Cover each egg with another egg shaped piece of dough. Press edges to seal. Bake in a 450F preheated oven for 8 to 9 minutes or until golden brown. Add the remaining chocolate chips to a microwavable bowl. Add vegetable oil. Microwave on 50% power for 45 seconds. Stir. Microwave an additional 15 seconds on 50%. Stir. If not melted, then put in another 15 seconds at 50% power. Add a teaspoon of melted chocolate to the top of one of your baked Easter eggs. Spread with a pastry brush to cover. Top with sprinkles or candies. Repeat for remaining eggs. Very cute idea for Easter. Would be fun to do these with my niece. I always love something new to try! These Easter Egg Hand Pies look so delicious and I love how pretty they turned out to be! Thanks for the recipe. I love it! Aww! Super cute and they sound yummy! Thanks for sharing! I like easy, fun recipes like this. Good idea to use the canned dough. These are so cute.Can not wait to make these. Their just so stinking cute. This is a different and cute way to make hand pies, the kids would love these!! Hi Stacie! I’m visiting form Show and Tell Link Party from Sugar Bee Crafts! I love that the pies with green sprinkles looks like grass and cute little eggs! These are adorable and sound super tasty! Thanks so much for sharing! I love this idea- they’re so cute and they sound delicious! I saw this on Create and Share linkup and cannot wait to try this recipe! Thanks for sharing! These sound so delicious and look so festive. I love that they are pretty easy to make too, my kids would love to make these!! Thanks for lining up with Inspire Me Monday. I hope you have a blessed Easter! These look so yummy and easy. I was looking for something toddlers could “help” with and these would be perfect! These are so cute and clever! I have some pie crust in the freezer and will make these with my kids tonight ! Thanks for sharing!